The opening game of this series was tied 2-2 after the first period. In the second, the 7th-seeded ’01-’02 Canucks scored three times and took a 5-3 lead into the third period. Defenseman Mattias Ohlund then scored his second of the game almost nine minutes into the third to seal a win for the ’01-’02 Canucks.The ’92-’93 Canucks exploded for nine goals in Game 2 as they won 9-3 with Cliff Ronning and Pavel Bure both posting six points and registering hat tricks. Then, it was the ’01-’02 Canucks’ turn to blow out the ’92-’93 Canucks in Game 3 and they did so 8-3. Markus Naslund led the way with two goals and four assists for six points while linemates Brendan Morrison and Todd Bertuzzi totaled nine points, five and four, respectively. In Game 4, a goal from Ronning in the final minute of the second period gave the ’92-’93 Canucks a 2-1 lead. Then, nearly halfway through the third, Dixon Ward scored to make it 3-1 before a couple minutes later Matt Cooke cut the lead to one for the ’01-’02 Canucks. However, the ’92-’93 Canucks would hold for a 3-2 win and make the series 2-2. 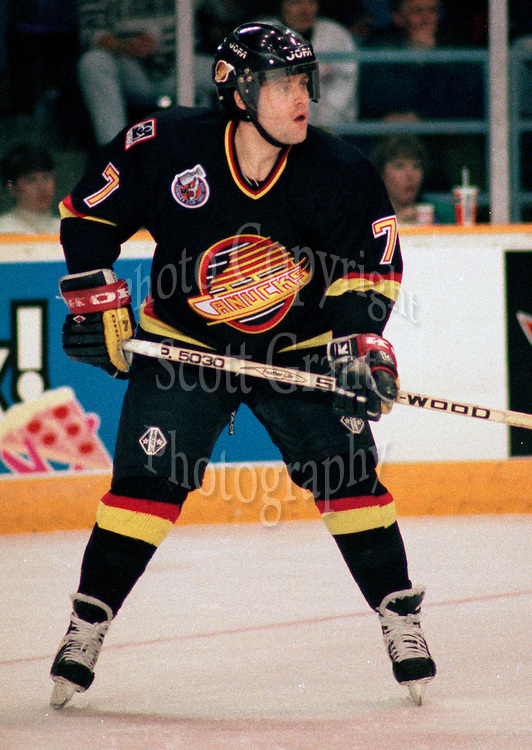 The ’92-’93 Canucks then scored five goals in the third period of Game 5 to lead them to a 7-2 win with Bure, Ward and Trevor Linden all scoring twice. Then, in Game 6, the ’01-’02 Canucks led 2-1 at the start of the second period. Bure scored exactly six minutes into the second to tie the game and then Linden scored with less than six minutes left in the period to give the ’92-’93 Canucks a 3-2 lead going into the third. Defenseman Ed Jovanovski scored seven seconds into the third to tie the game for the ’01-’02 Canucks. The two teams traded goals towards the middle of the period as they ended regulation tied 4-4. At the 13:51 mark of overtime, Ronning scored to end the series for the ’92-’93 Canucks as they won the game 5-4 and the series 4-2. So the 2015 Vancouver Canucks Qualifying Final will pit the top-seeded ’10-’11 Canucks against the 6th-seeded ’92-’93 Canucks! This entry was posted in Qualifying Tournament, Ultimate NHL Playoff and tagged Brendan Morrison, Cliff Ronning, Dan Cloutier, Dixon Ward, Ed Jovanovski, Kirk McLean, Markus Naslund, Matt Cooke, Mattias Ohlund, Pavel Bure, Qualifying Tournament, Todd Bertuzzi, Trevor Linden, Ultimate NHL Playoff, Vancouver Canucks. Bookmark the permalink.